The Rexel Style Plus Cross-Cut Paper Shredder shreds up to 7 sheets at a time and has a P-4 security rating which means it can be used to shred highly confidential documents. Suitable for use in either the home or small office, the shredder has a stylish modern look and a pull out 12 litre bin which can hold up to 80 shredded sheets. 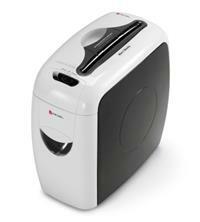 The shredder can also handle staples, paper clips and even credit cards and has a noise level of less than 73 dBA. Other features include auto start/stop and a reverse function to help clear any paper jams.